After my previous trial run of making a custom controller with an older one, I decided to try my skills with a brand spanking new one! It's actually amazing how much the official controllers have changed over the years. This one had light gray sticks and D-pad, and a glossy white bottom. My old controllers (white and pink) both had dark gray sticks, D-pad and bottoms and the home button in the middle had a brushed metal look to it, while the new ones have a chromed look. So the first step was to, obviously, unbox my new controller and then remove all the case screws on the underside with my size 8 Torx screwdriver. There are 7 screws in total, 6 of which are easily visible, the 7th I've highlighted in the bottom picture to give a better idea of where it is. It's usually hidden by a bar code sticker. So once all that is off I open up the case, which can require a bit of maneuvering of the trigger buttons. It's also important to open it with the button-side facing down, otherwise the buttons will just fall right out if they're not being held in by the case/controller innards. Here's a decent picture of the insides of my new controller. On the left is the bottom of the controller with the circuit board sitting in it. The circuit board is not attached to either part of the case, so you can also take the board completely out. On the right is the front of the controller case with the rubbery backings for all the buttons and the D-pad. Again, that rubbery backing will NOT hold the buttons in by itself, if you turned that over all the buttons would just fall out. So I decided this time around to do a pink and orange controller, since my trial run had given me the orange controller I had originally planned for, and since I had extra orange parts due to my accidental double order. I bought my orange parts from extremerate.com (and one set from Amazon) and I bought my pink parts from this seller on eBay. I made the ABXY buttons a mix of pink and orange, and the start/back buttons pink. The analog sticks easily pop right off and I replaced those with orange ones. I also got a whole set of mini Phillips head screwdrivers so this time I would for sure have the right size and could replace the D-pad. I didn't get a picture, but under the rubber part for the D-pad is a movement mechanism which has the front of the D-pad connected by two clips and two tiny Phillips head screws. Just undo those two screws and push the clips in and the front piece will come right off. Below is a picture of what the front piece of looks like, in both orange and light gray. 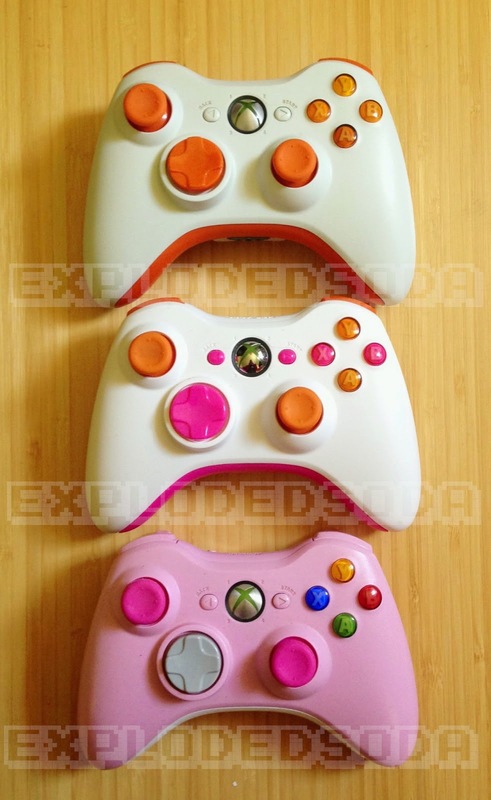 For some reason my orange D-pads didn't have the two clips, but the pink one did. I haven't had any issues so far with the clipless orange ones so I guess as long as they're held in by the screws it doesn't matter much. So to contrast my orange analog sticks I decided to go with a pink D-pad on this controller. While I was at it, I also popped open my trial run orange controller to finally give it a proper, orange D-pad! I chose to go with pink for the bottom piece of the controller, which just easily pops right in, and then orange bumpers for more color contrast. On the left is the front of the controller with the circuit board sitting in it, and all my colorful new triggers/bottom piece. On the right is the back piece of the controller case being sad and lonely all by itself. Since the bumpers were orange, of course the triggers would have to be pink! Now these are my least favorite piece to replace, since there's a lot of bending of plastic which I'm always scared I'm going to break. There's also a spring that goes in the trigger that I nearly lost last night when it sprung right out of my hand and across the room. I'm not even going to try and describe how to remove these, this guide does a much better job of explaining it than I could. Done at last! But wait! I figured I might as well use some of my leftover parts and tweak my light pink controller since all it's parts were an ugly dark gray. I replaced it's D-pad with the light gray one originally from this controller, replaced the bottom with the glossy white also from this controller and gave it two hot pink analog sticks. I wanted to give it hot pink bumpers, but I guess the plastic wasn't shaped or cut right, because I could not get the hot pink bumpers to work, so I just had to leave them light pink instead. So just beware that you can get funky parts! Also, for comparison, here are my 360 and PS3s side by side. Twinsies! you amaze me. Hope you are well. I wanted to draft you one little bit of word just to give thanks once again just for the pleasing pointers you have discussed above. This has been quite remarkably open-handed of people like you to present without restraint exactly what many people could possibly have advertised for an e-book in making some dough for their own end, mostly considering the fact that you could possibly have tried it if you ever desired. These techniques in addition acted to be the easy way to understand that someone else have a similar eagerness really like mine to see a great deal more regarding this issue. I think there are a lot more pleasant instances ahead for individuals that check out your site.